We use hand peeled, naturally dried, white Cedar Logs to give the gazebo a natural, rustic appeal. 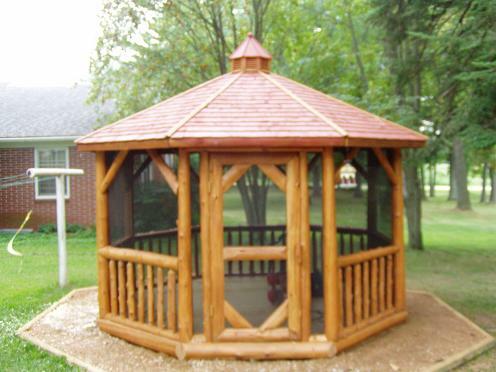 Our large cedar logs give the gazebo a heavy, massive appeal that you won't find with other products. Most log Gazebos use "milled" logs which are put through a machine so they are all the same size. 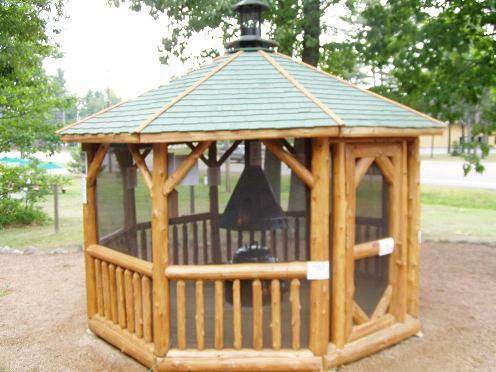 Our Gazebos are made from the unaltered natural log. It takes more time to make a Gazebo this way but the result is a very distinct, rich, natural look. The screen enclosure and massive log door is standard on all log Gazebos. The logs on the inside of the gazebo are cut on a flat even plane to accept the panelized screens which are removable. The customer can choose between several popular log finishes in many different colors. Options include roll-up vinyl windows, light/fan. As with our standard Gazebos the price includes installation on your reasonably level site in Wisconsin & adjacent states. Please call for delivery and installation prices for states outside of Wisconsin. We will gladly provide estimates for any special installations where the Gazebo is elevated to accommodate sloping terrain or installed adjacent to the customer's deck.